I’ve been looking for an all white comforter that was snuggly and made the room feel peaceful and relaxing without looking like a hotel comforter. I did a lot of searching and found this one. I love it. A superb complement to any bedroom aesthetic, this beautiful comforter set features a pin tuck design and crisp white color. Made of durable and cozy polyester microfiber, this generously sized set has thick, plush inner fill that's excellent for staying comfortable and regulated while you sleep. This is a beautiful comforter set, love it and the new look to my bedroom. Have a poster bed so order the 31 inch drop bed shirt and its perfect! This Comforter Set is not only eye-catching, but so comfortable and easy to clean! The pin tuck detail looks classy and cozy, and the material is comfortable (for both people and dogs) and is surprisingly easy to clean too! Our dog had an accident on it, and the stain came right out with a little cleaner! Very pleased with the size, feel and quality. Love the texture and look of this comforter set. It makes the solid white pop against the other bedding. Ordered the queen, and the size is excellent. It's pretty soft, too. Haven't washed it, but it is supposed to be machine washable. Really pleased. This comforter is beautiful! The queen size fits a queen bed perfectly. There is plenty of overhang on the sides and ends. The fabric is incredibly soft and the comforter is very lightweight yet warm. I had expected to need a blanket during the winter, but even during our 30-below nights, all I had on the bed was a top sheet and my comforter! Luxurious comforter set in pristine white. 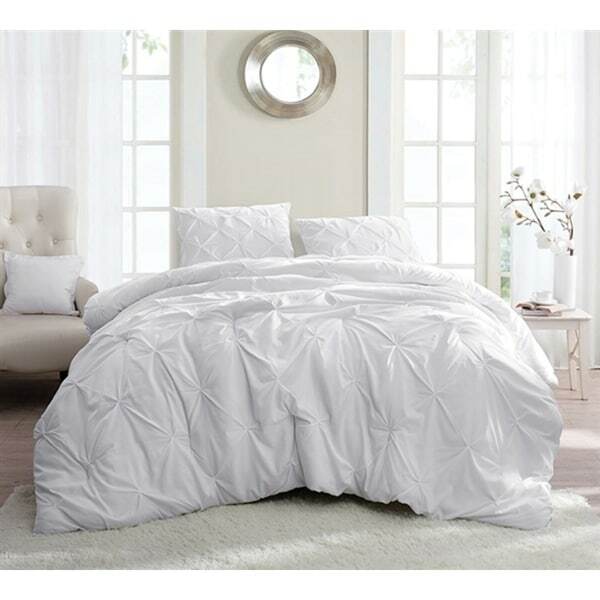 The white makes my bedroom look fresh and this comforter helps me snuggle up and sleep peacefully through the night. Win! This is a beautifully well made comforter set. It’s a true white and very soft and well made. I purchased it for my teen daughter as she loves it. Very simple and elegant. I absolutely loved this comforter for my dorm room! I wanted a white and pink color scheme for my room and this worked perfectly. It was so soft and wasn't too heavy for living in Florida. I really like the look of the tucks/gathers on this comforter. Gives an otherwise boring white comforter a really nice look that can go with any decor. 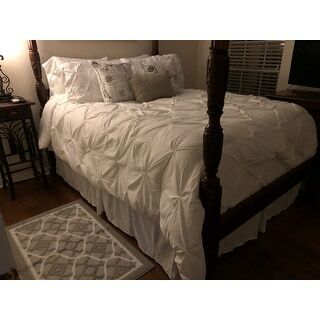 I have not washed it yet so I'm not sure how it will hold up during the wash.
Beautiful white comforter...very soft and luxurious. I bought the full size for my daughters twin xl bed in her dorm. Very nice and high quality. Great buy. Used for model home and it looks good. Not sure if the pin tucks will hold up but this is perfect if you need a inexpensive comforter. Honestly such a comfortable comforter, and it gets a ton of compliments. My only thing is that it can sometimes get too warm if the heat is on high. I love the size and the look of this comforter. It’s super soft and doesn’t look cheap. This was a nice comforter set. It’s very soft and light weight. light weight, but very cozy. "1st Time using this app. Do you deliver the items the costumer’ houses?" "how do I order product? can use phone?"